The Herschel Team has developed a number of space and astronomy activities for use in schools, all related in some way to the Herschel Space Observatory. The UK Herschel Team are now offering these activities to schools nationwide. The lessons are available for a range of ages, and use information and images from this amazing satellite, currently operating 1.5million km from Earth. Activities range from the design of the Herschel Telescope, to the advantages of using light at a range of wavelengths, to the impact that space dust can have here on Earth. Click here for more information and to see a list of the activities available. A range of online activities and games linked to Herschel which can be run in the browser. A number of posters are available to download, covering a range of the science topics which Herschel is addressing during its mission. The posters are freely downloadable and are available in a range of sizes. The source files are also available in case you'd like to chance them or add your own information. 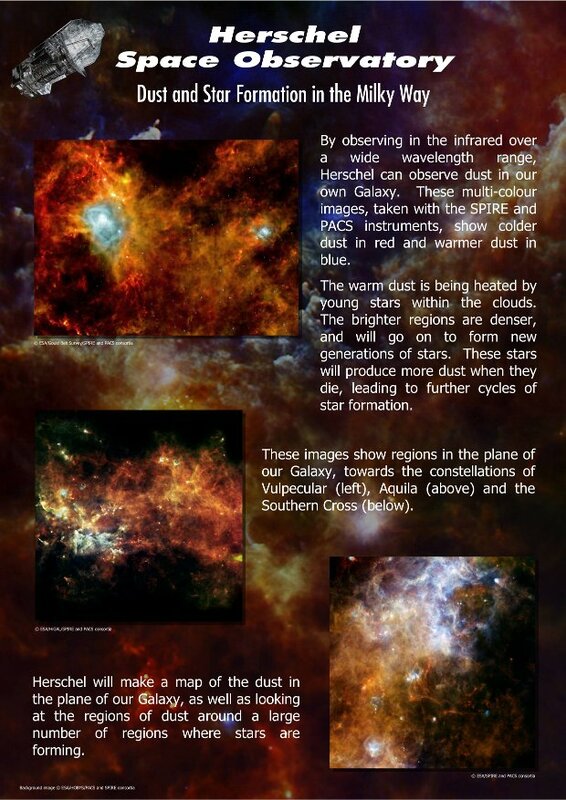 Click here for more information and to see all of the posters currently available, about Herschel and related topic. Some cut-out models of the Herschel spacecraft are available to download, print out and make yourself. You can either colour them in yourself, or print the version with colours already added. Click here for more information and to see the models currently available. Herschel scientists are frequently giving talks to astronomical societies, schools and other groups. A few of them are downloadable as PDFs. Click here for more information and to see the talks currently available. This multiwavelength view of the sky allows the full sky to be viewed a a number of wavelengths. What's more, you can fade between the wavelengths to compare them. There is a search facility so you can find where objects are in the sky, and there's a blog with some more information. The tool simply runs in a web browser (Google Chrome has been found to be the fastest), and is downloadable so that it can be run on a stand-alone machine in a classroom. It doesn't require an Internet connection to work, apart from the Search facility. A citizen science project from Zooniverse.org, which asks users to help scientists look for features in our own Milky Way. The data is from Herschel and NASA's Spitzer satellite. You can search for bubbles in the interstellar medium, or find holes in the clouds of gas and dust. The National Group for Learning in Wales (NGfL Cymru) have produced an educational resource which uses Herschel results to explore the origin of the chemical elements. There is an interactive powerpoint presentation, as well as a reduced version of Chromoscope which shows only a selection of the wavelengths. Click here for more information, or here to download the resource. This site, run by the NASA's Infrared Processing and Analysis Centre and the Spitzer Science Centre, has excellent information about astronomy at a range of wavelengths. There are images of a large number of objects at a range of wavelengths, and crucially some accompanying information. It also has lesson plans and classroom activities - though they may be targeted more at the US curriculum. Agent Exoplanet: using real data to work out the properties of planets around other stars.